Welcome to the Anchorage Museum’s virtual teacher toolbox, which features all the resources you need to teach your students about the history and culture of the Dena’ina Athabascan people. This site is one of many cultural renewal efforts to raise awareness of the indigenous people of Southcentral Alaska. This educators’ site was created in conjunction with the Anchorage Museum’s 2013 exhibition Dena’inaq’ Huch’ulyeshi: The Dena’ina Way of Living, the first major exhibition presented about the Dena’ina Athabascan people. These materials are designed to work in your classroom. You may facilitate a structured experience using these lesson plans, or modify them to meet existing classroom curriculum topics or standards. There are additional exhibition resources available at the Anchorage Museum website, including an exhibition overview, a gallery of exhibit and object photos, and an illustrated timeline. Bring the Dena’ina Traveling Kit into your classroom. Learn more about reserving this kit at http://www.anchoragemuseum.org/galleries/Denaina/educators.aspx. Dena’ina Tools for Teachers is made possible through the generosity of the William Randolph Hearst Foundation. 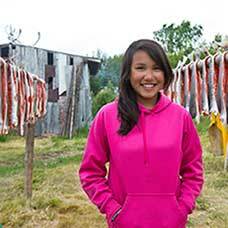 Ashley Wilson at fish camp in Nondalton, Alaska, 2013. Photo by Chris Arend/Anchorage Museum. The content in this virtual teacher toolbox is also available in a DVD format. The DVD is free, but supplies are limited and will be distributed on a first-come, first-served basis. To order a DVD or for more information, call (907) 929-9280.